4 Smart - Replacement / lost Smart car keys - Key stopped working - relearning - coding"
If you Smart car key stops working and fails to lock or unlock the car you should firstly replace the battery in your key fob. If pressing the unlock button makes the indicators flash for 9 times and your Smart has the key symbol on the dash, your car will be immobilised preventing you from driving. In this situation we will come to you to replace the battery and relearn your key into your car. Smarts come new with two keys. Unfortunately the spare is not always learnt into the car. We can learn your keys into your Smart at a fraction of the cost Mercedes would charge. 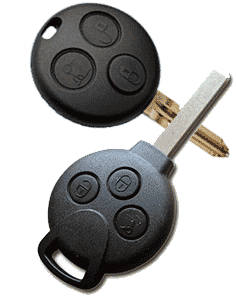 If you have lost or only have one key and wish to purchase a spare we can also supply a new blank key and learn a transmitter into your Smart for you. You can gain access to a locked 450 fortwo manually using the key in the boot or on a 451 fortwo or Roadster with the key in passenger door, if right hand drive. You will need to remove the plastic blanking cap.